Below is a summary of some newsworthy cases handled by Wyatt & Blake. Click on the links to see copies of the attached opinions. A few of the articles/publications mentioning Wyatt & Blake are also linked below. Please note that in white collar criminal investigations, the best result is avoiding the filing of any charges and any publicity. Thus, our firm has represented numerous business executives and companies whose name you will never hear. Wyatt & Blake is currently serving as plaintiffs’ co-counsel in a qui tam complaint filed in the Western District of North Carolina by an emergency room physicians’ practice against Lake Norman Regional Medical Center, Davis Regional Medical Center and Health Management Associates, one of the nation’s largest hospital chains. This lawsuit was unsealed in January 2014 and the United States has indicated that it intends to intervene in the lawsuit against the defendants. Click here for a news article concerning the litigation. Wyatt & Blake recently represented a CEO of one of the largest banks in the United States in connection with litigation arising out of an acquisition by that bank. Click here for a news article discussing a recent settlement of that litigation in which Mr. Wyatt is quoted. Wyatt & Blake represented a Mecklenburg County Sheriff’s Officer on federal criminal charges relating to the alleged use of excessive force on an inmate. All charges were dismissed at trial by the United States District Court Judge after the Government rested its case. Click here for an article concerning this case. Wyatt & Blake represent qui tam plaintiffs in connection with a lawsuit filed against Health Diagnostic Laboratory Inc. alleging that illegal kickbacks were made to doctors in exchange for samples of blood being sent to HDL’s lab for testing. The United States intervened in this lawsuit and HDL has entered into an argument with the Department of Justice to pay $47 million to settle the lawsuit. Click here to read a Wall Street Journal article about the settlement. Wyatt & Blake served as co-counsel for The Coca-Cola Company in a trademark lawsuit filed against the company by High Voltage Beverages, LLC. Following a federal jury trial, a jury determined that no trademark infringement occurred. Wyatt & Blake represented NASCAR in connection with a federal civil lawsuit filed by former race car driver Jeremy Mayfield over a failed drug test and NASCAR’s substance abuse policy. All claims asserted by Mayfield were dismissed. Click here for the district court’s opinion dismissing all claims. Wyatt & Blake served as co-counsel to qui tam plaintiffs in a whistleblower lawsuit filed in the United States District Court for the Western District of North Carolina against Adventist Health System. The United States Department of Justice intervened in this lawsuit and reached a settlement pursuant to which Adventist agreed to pay $118.7 million to settle the allegations of illegal kickbacks. Click here to read an article about the settlement. Wyatt & Blake represented a securities broker in connection with a federal civil lawsuit filed against him asserting allegations of insider trading under Section 10(b) of the federal Securities Act and Rule 10(b)-5. The federal district court entered an order dismissing all claims asserted against the broker. Click here for the Court’s opinion. Our firm served as co-counsel to Horizon Lines in connection with a class action lawsuit filed against the company in North Carolina Business Court asserting civil claims of antitrust violations. The Court dismissed all claims asserted against Horizon Lines. Click here for the Court’s opinion. 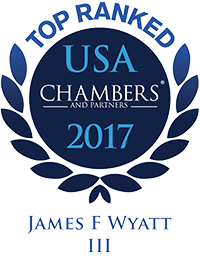 Mr. Wyatt was previously named by his peers as the top criminal defense attorney in the State of North Carolina. 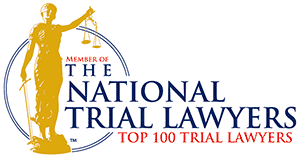 Click here for the article appearing in Business North Carolina, 2005 Legal Elite issue. Click here for an article quoting Mr. Wyatt regarding his representation of a former CEO of one of the country’s largest corporations.